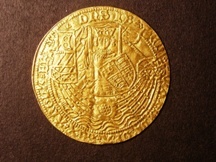 656 Ryal Edward IV continental imitation Flemish mint of Gorinchem. S1952. 16th century.  mm none/crown. V.F. 657 Ryal Edward IV London S1950. Large fluers in spandrels. MM Sun, slight crack & has been gilded, otherwise, V.F.